Page 53 — Introducing Whelk of the Octopus clan, Gull of the Anemone clan, and Chirikik of the Fins. Hands and Fins can do so many things for each other… in this case they can get each other in trouble! First post on the new schedule — in case you missed it, I’m now updating on Fridays instead of Mondays, around about 3 pm Pacific Time. Please let me know how this works for you! I’d also love to hear feedback from people about the new characters and new threads I’ve been weaving into the story, and I’ve been experimenting a bit with the art — tell me what you think! I love comments! 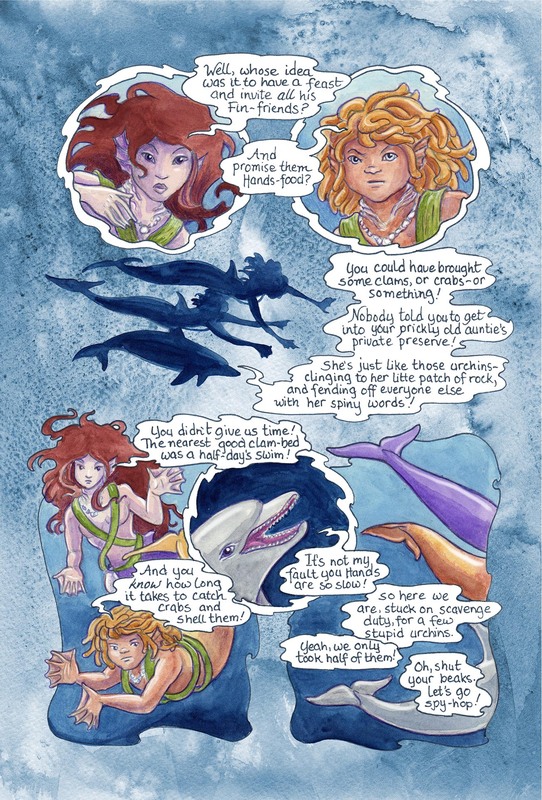 This comic was posted in Mermaid Music and tagged comic, dolphin, graphic novel, merfolk, mermaid, sea comic, watercolour, webcomic. I absolutely love this write faster cuz. I would love to have a hard copy for my grandaughters. Thanks, Ginger! Actually, it’s not a case of writing faster, but drawing — and I’m doing that as fast as I can! The writing is always a couple of chapters ahead, and the whole story-line is blocked out already, but it takes a lot of time to draw, ink, and paint each page! PM me about ordering one — mailing is pretty expensive to the States, so we should discuss how to do it.